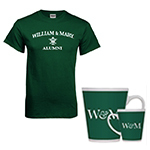 To provide alumni and friends with a wide variety of W&M gifts and gear, the Alumni Association has partnered with several reputable retailers. 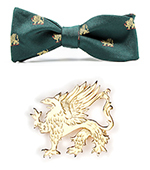 From bowties and William & Mary tartans to griffin pins and captain’s chairs, find the most exclusive W&M gifts, directly from the Alumni Association. Choose from a wide variety of fun gifts, including T-shirts, golf bags, grilling tools, sunglasses, Under Armour apparel, mugs and accessories from Folletts. An engraved brick is a great way to honor someone special for years to come. We will inscribe your brick with their name and class year or any sentiment, honor or memory you’d like to express... the possibilities are only limited by the number of characters. 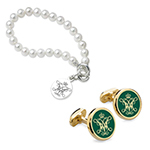 M. LaHart offers cufflinks, official accessories, collectibles, commemorative frames, fine watches and more — expertly crafted, personally engraved and beautifully presented. 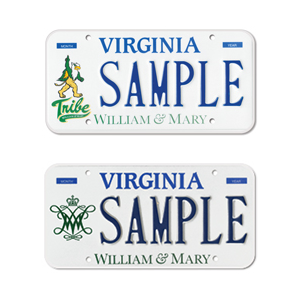 Show off your Tribe Pride wherever your travels take you — purchase a W&M license plate through the Virginia DMV! The plate features the cypher and the university word mark. And, with each plate sold, William & Mary receives a $15 contribution to the scholarship fund, which is considered tax deductible. Learn more and purchase at dmv.virginia.gov. Want to show off your Tribe Pride anywhere — especially every time your mobile phone rings? Then download our fight song ringtone. Print your own W&M graphics.